An excess amount of Botox is injected into the face, causing paralysis of underlying muscles, instead of relaxation of those muscles. The forehead is a common area of excess application of Botox, although inexperienced injectors can also over-apply to facial lines. The result is no movement, instead of no wrinkles. This cannot be corrected. Fortunately the effect of Botox will wear off after 3-4 months. One eyebrow is continually pulling up too high, causing a Mr. Spock look, also called Mephisto brow. Odd wrinkles can also occur over the lateral brow. This is caused by uneven application of Botox between or above the two brows and can be corrected. This is the most common error with Botox treatments. This condition is caused by over application in the frontal muscle and poor placement. The excess Botox relaxes this muscle, causing a heavy sensation for the patient. When the forehead muscles drop, the eyebrows also drop. Patients with hooding (excess eyelid skin) are prone to raising their eyebrows to increase openness of the eyes. For these patients, dropping eyelids are exaggerated. Patients commonly report not being able to fully open the eye lid. This condition is commonly caused by inexperienced injectors who incorrectly perceive the patient’s use of this muscle. In cases where a close eyelid interferes with vision, prescription eye drops can help temporarily reactivate the eyelid. Sometimes a brow lift performed with filler can also raise the eyebrow to achieve a more balanced appearance. Muscles controlling facial movements are injected incorrectly, resulting in one side pulling up or down. This condition is more noticeable when the face is in motion. 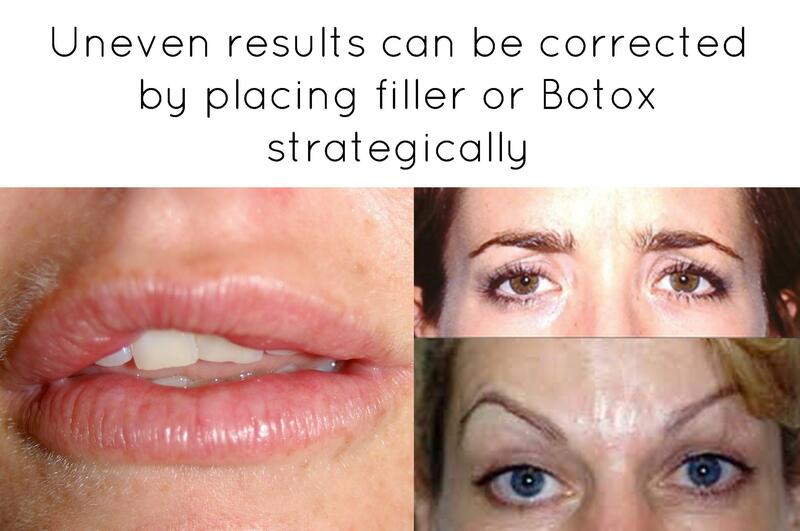 When Botox is incorrectly injected around the lower crow’s feet or eyelids, the Botox can migrate to a muscle that elevates the corner of the lip and cheeks, causing an uneven facial sag. There is too much relaxation of the orbicularis oculi. With patients with loose muscles in that region, Botox applied to crow’s feet instead puffs the area, and Botox migration into the lower lid worsens the patient’s condition.